Do you know what hand mudras are? Have you ever used them? They can be used daily for just a few minutes at a time, so like Reiki et al, they are a portable form of healing. Based on yoga and the connections we make when we touch one or more fingers to another finger (or fingers), they have a healing effect on your physical body and energy system. If you are sensitive to subtle energies like Reiki then you will probably find that each mudra feels a little different from the others. Some are lighter, some are more “earthy” or even “buzzy”. Some help you to feel calm, others give you a little energy ‘boost’. I also use a book by Gertrud Hirschi which is a very good reference, particularly for the lesser-known positions. It is a thorough guide. If you’re just starting out with hand mudras, I recommend you begin with the positions using thumb and one other finger (Gyan, Akash and Prithvi) – just hold each one for a couple of minutes until you get used to the process. You’ll soon find that you’ll want to hold a position for longer. If a mudra causes you to feel a bit edgy or over-stimulated, perhaps stop that one for the moment, and use another; or just come back to it another day. Just play and see which ones help you to feel more healthy or balanced. 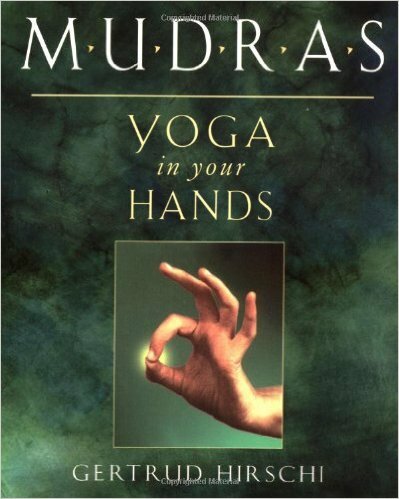 Mudras can be done anytime and anywhere (although you may wish to do them discreetly!) I often do them when in the car as a passenger, and usually when meditating or watching television. They will benefit you most when you are quiet, and in a state of allowing. I am not an expert on hand mudras, but I do use them daily. I created The Hand Mudra Empowerment so that I could draw on the specific energies of ten of the mudras when it wasn't practical to form the hand positions. Etheric hand mudras are just as effective as physically-held ones. If you would like to try out one of these energies, then clicking this link will take you to an encoded image, which has been programmed with the Gyan mudra energy. You will receive the energy of Gyan for 5 minutes each time you open the image.